Southern senior Lauren Lavender (22) settles under a flyball during the Lady Tornadoes’ 7-2 victory over Waterford on Wednesday in Racine, Ohio. RACINE, Ohio — The Lady Tornadoes got off to a great start and cruised to the victory. 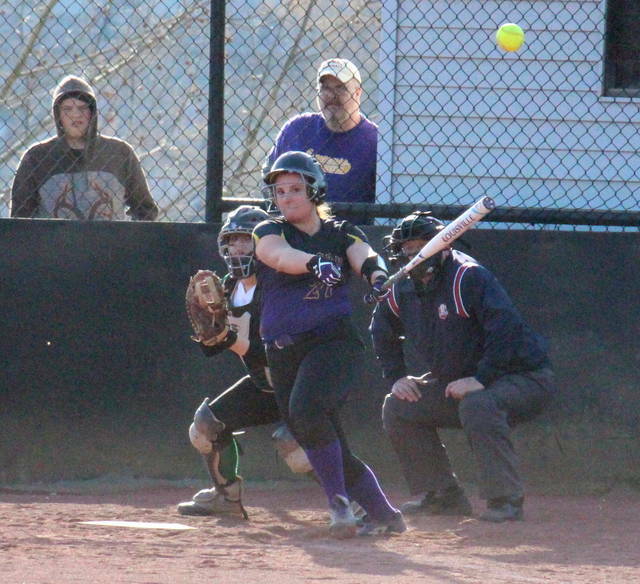 The Southern softball team bolted out to a 7-0 lead two innings into Wednesday’s Tri-Valley Conference Hocking Division matchup with visiting Waterford, and the Purple and Gold held on for the 7-2 win. In the home half of the first inning Southern (4-2, 4-1 TVC Hocking) broke the scoreless tie with Jaiden Roberts scoring on an error. Courtesy runner Ciera Whitesell scored on a bases loaded walk in the first, and then Lauren Lavender and Shelbi Dailey scored on consecutive fielder’s choices. 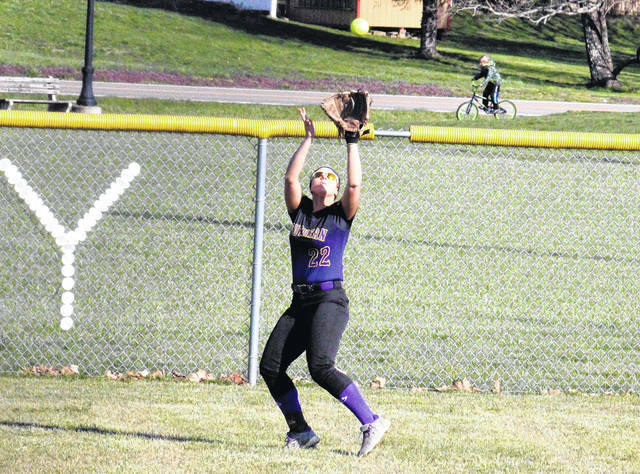 In the second inning for SHS, Roberts singled home Kassie Barton, Paige VanMeter singled home Josie Cundiff, and Lavender singled home Whitesell. Southern left runners in scoring position in the fifth and sixth innings, but couldn’t add on to its run total. Waterford (4-2, 3-2) ended the shut out in the third frame, as Alayna Jones and Marissa Neader both scored on a one-out error. 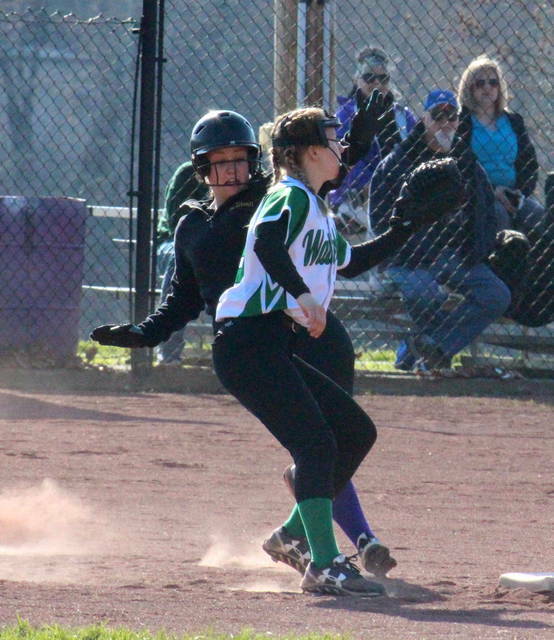 The Lady Wildcats were retired in order in the fourth, fifth and sixth innings, and left two runners in scoring position in the seventh before falling by a 7-2 final. Sydney Cleland was the winning pitcher of record in a complete game for SHS, allowing two earned runs on five hits, while striking out six and walking zero. Emma Baldwin suffered the loss in six innings for Waterford, striking out two and allowing seven runs, four earned, on 10 hits and three walks. 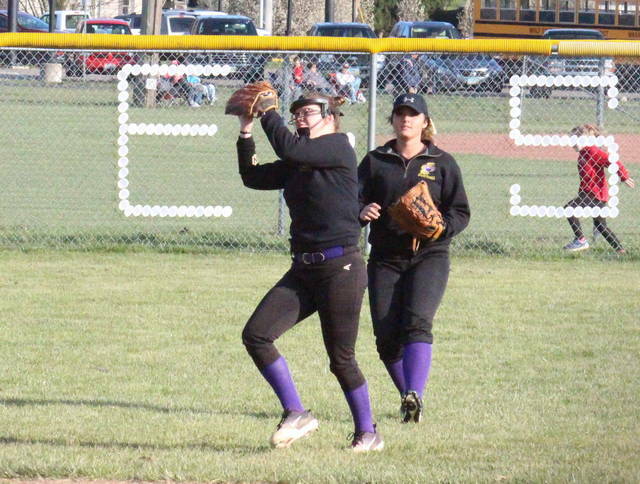 Roberts led the SHS offense with a 3-for-4 day, which included a double, a run scored and a run batted in. VanMeter singled twice and drove in two runs, Dailey doubled once, scored once and drove in a run, while Lavender singled once, scored once and drove in a run. Barton singled once and scored once, Cleland and Baylee Grueser both added a single, while Cundiff scored once and drove in a run. Whitesell scored a game-high two runs in the win. Neader doubled once and scored once for the guests, Jones singled once and scored once, while Baldwin, Jordan Taylor and Bailey Offenberger each singled once. Waterford committed six errors, twice as many as the Lady Tornadoes. SHS left nine runners on base, two more than WHS. These teams are scheduled to rematch on April 30 in Washington County. Southern is slated for non-conference action next, as the Lady Tornadoes host Ravenswood on Friday.